My late mother was a huge fan of Beatrix Potter and her works. She had plates, figurines, even a Barbie doll in a Potter character covered dress. 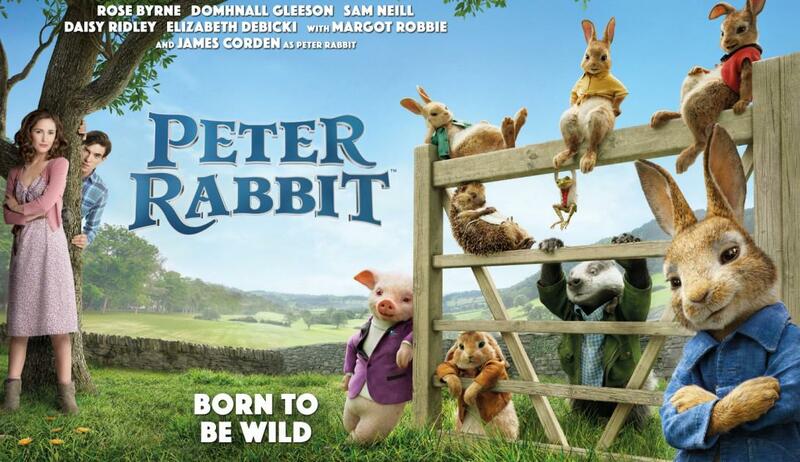 What she would have made of this big screen adaptation of one of her favourite characters, Peter Rabbit, would probably be one of disgust. For this has as much to do with Potter’s gentle and charming creations as a vegetarian meat pie has to do with, well, meat! Peter Rabbit and his sisters, along with cousin Benjamin Bunny, have, for years, been taunting Mr McGregor and stealing from his garden. A fact that hasn’t gone unnoticed from neighbour, Bea, a nature-loving would-be painter, who has always wanted his garden to be given over to the wildlife. When McGregor dies, the animals celebrate by taking over his home until grandson, Thomas, arrives from London. With a lack of interest in the house apart from selling it, Thomas considers the rabbits to be rodents and wants them gone. Yet Peter is determined to have the upper hand and so mini-war breaks out between the new owner and the bunny. About 15 minutes into the film, there’s a short animated sequence using Potter’s original drawings and for those few brief moments, you see the film you really wanted to see in the first place. This is short-lived and what you get is a crass, often violent mix of CGI and live action, where the jokes can from a broad sense of the word, sledgehammered home by director and co-writer Will Gluck, the man who gave us the modern version of Annie! Borrowing heavily from the likes of Home Alone and Tom & Jerry, the film thinks that by electrocuting people, hitting them with heavy objects and, worst of all, forcing a character to eat blackberries when they have heard this person is allergic to them, making them use an epi-pen, seems irresponsible. It has been reported that Sony Pictures has apologised for the scene, yet it still appears. 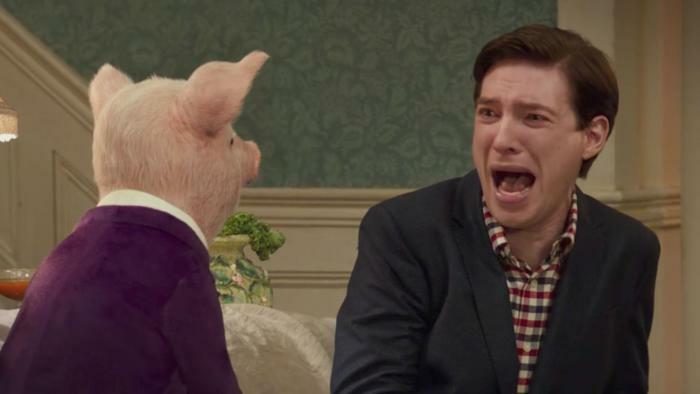 We also get a succession of jokes about body parts and bodily functions that wouldn’t seem amiss in a Seth Rogan comedy (“Give him a wet willy!” Yes, it does appear!). Throw into the pot a succession of pop tunes that have little or nothing to do with the plot or visuals and you long for headphones to drown out the noise. You know when you have failed as a family film when the young audience in my screening spent more time going back and forth to the toilets and talking throughout (as well as kicking the back of my chair). Most modern family films will have enough to keep the adults amused and on evidence of this showing, it was the adults in the film that were giving the most satisfaction. Rose Byrne and Domhnall Gleeson as Bea and Thomas were a delight. Gleeson, particularly, was managing to squeeze every inch of comedy out of the limp script to make it just about bearable. Give these two another film with a better script and we would be into comedy gold territory. As for the animated creatures, the cuteness of Potter’s world is drained out of them. Even with the voice talents of the likes of Daisy Ridley, Elizabeth Debicki and Margot Robbie, cannot stop them from becoming annoying. Then there’s Peter himself, originally a mischievous child rabbit who, while never vindictive or nasty, taunts Mr McGregor but would never cause harm. With James Cordon as the voice, he has become smug, irritating and with a nasty streak. He plots to destroy McGregor mostly because he feels he is taking Bea away from him. Yes, jealousy can be a horrible emotion. You end up with more sympathy for McGregor than for the title character. 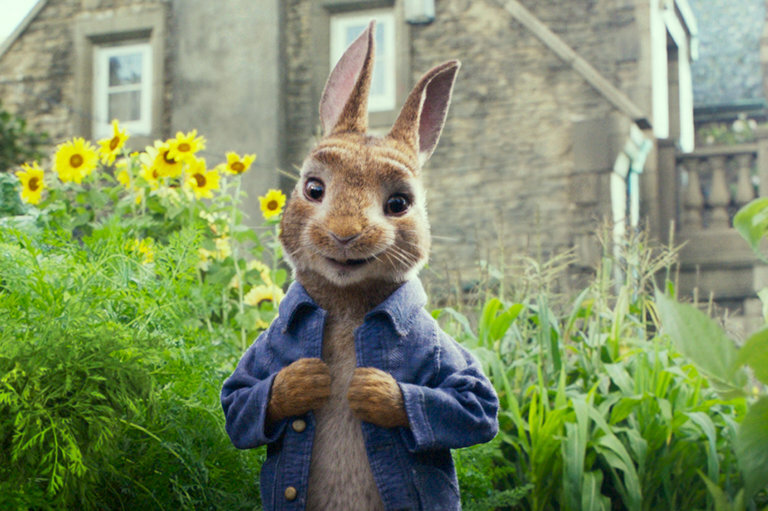 Peter Rabbit is basically the use of an already famous creation and taking it away from anything close to noticable of the original story in order for Sony to make money. A habit that seems to be happening more often. Please leave what is sacred alone and use another name for your monstrosities. Maybe you should change this from Peter Rabbit to Annoying Bunny!